Jorge Canyon. The Centroid. The Six-Pack. Sperm Lake. Circle Squares. The Dong. These are the inside names of some of the secret hiding spots in the greatest aerial playground in the United States. For 10 years I was fortunate enough to be a member of a squadron flying the F-5 Tiger II as an adversary pilot, or Bandit, with VFC-13 in Fallon, Nev. For a pilot who loves flying (and there’s a shameful number who don’t), the convergence of the last real “stick-and-rudder” fighter in the U.S. inventory, a vast swath of airspace to patrol (surface to stratosphere), and a squadron of like-minded ACM junkies, this is the place bad boys pray to end up when they go to heaven. I was a reservist in this squadron and thus had the benefit of perspective, having already given up flying a magnificent flying machine, the F-14 Tomcat. I knew that every flight was a gift, every dogfight a treasure, every merge one step closer to the day when Peter Pan would have to leave and grow up. With just a few years remaining for me to fly the F-5, I realized that I wanted to preserve the moment for as long as possible, to distill it as I was experiencing it so that I could dip into it in the years of ordinary life and take a sip. I decided that I wanted tell the story of this world in a visual way. I enlisted a spectacular director, wrangled some cash from enterprising investors, and the result, three years later, was an award-winning documentary about the spirit and adventure of Naval Aviation, Speed and Angels. It is an unvarnished, full-throttle, pulse-pounding peek into the heart of flying fighters for the U.S. Navy told through the eyes of two young aviators. But the genesis of the film had always been the concentrated passion for air combat that we enjoyed flying F-5s in Fallon. The F-5 is a peculiar bird (VFC-13 currently flies F-5Ns, most of which were procured after 2006 from Switzerland). It is tiny for a fighter, especially one with two engines. It has no modern systems, unless you consider hydraulics to be modern. No Anti-Skid. No INS nor GPS. No HUD. Just a simple old-fashioned pulse radar and a basic gunsight. It has no defensive systems, no RWR nor expendable countermeasures, other than the fact that when pointed nose-on to an adversary it completely disappears, like a cloaking device being activated. There is no sophisticated technology required to enable the disappearing act, just the fact the pilot sits in a cramped little cockpit on the head of a needle with tiny, razor-thin wings behind him. It is a plane perfectly suited to the role of adversary; fast, simple, nimble, eminently beatable by a competently flown front-line fighter; but capable of pouncing on an error and creating a learning point in the form of a simulated kill. If you lose to the F-5, you have something to learn, and that’s the way it should be. It’s often mentioned that the F-5 is used as an adversary because it is a perfect simulator for the Mig-21, and it’s true: the V-n diagrams superimposed show almost identical maneuvering performance characteristics. That is a great serendipity, but in truth, it would have been a perfect adversary platform regardless. 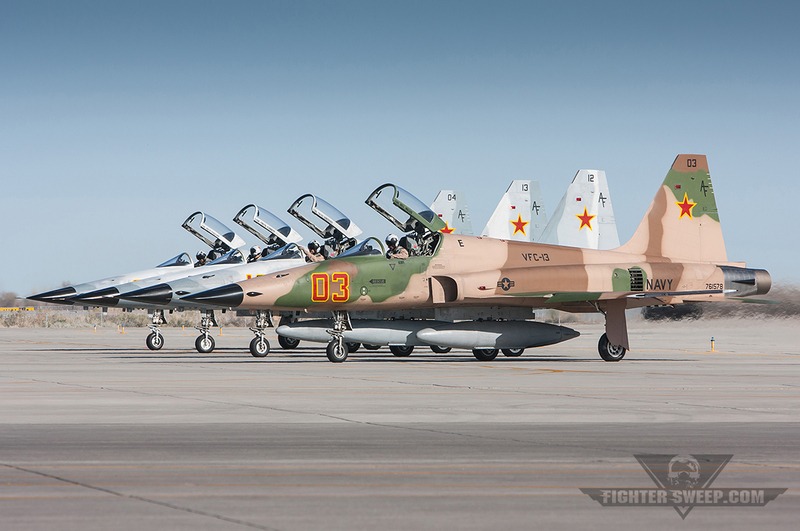 VFC-13 models its presentations to what is known as the ‘percentage threat’, the most likely global scenario for our fighters to face in combat. Think North Korea. Lots and lots of small, fast, simple enemy fighters swarming the technologically superior but numerically challenged Navy forces. Topgun, which is across the street on NAS Fallon at the Naval Strike and Air Warfare Center, specializes in teaching the skills needed to defeat the more modern threat aircraft. To this end, Topgun flies the F-16 and F/A-18. Fantastic, superior platforms that can superbly simulate MiG-29s and Su-27s. Instead, VFC-13, known as The Saints, specializes in the Stalinist principle of ‘Quantity has a Quality all its Own’. North Korea operates over 400 Third Generation fighters and only 35 Mig-29s. Before any U.S. Navy pilots would get to test themselves against those Fulcrums, they would have to cut a swath through a cloud of Mig-21 and 23s. Paco Chierici flew A-6E Intruders and F-14A Tomcats during his 10 year active duty career. He flew the F-5 Tiger II for a further 10 years as a Bandit concurrent with his employment as a commercial pilot. Paco is currently a 737 captain. Paco is also the creator and producer of the award winning naval aviation documentary Speed and Angels. Paco has written articles for various international and domestic magazines as well as regular contributions to Fighter Sweep. He has signed with an agent to represent the sale of his debut novel, Lions in the Sky, a naval aviation thriller. Paco has the standard panoply of medals and ribbons but his proudest accomplishment is the Top Nugget award for landing grades from his first deployment.